Exploros | What Is Geography? Students are introduced to the study of geography—what it is and what it isn't. They explore and describe the six elements of geography. Next, they learn about the tools geographers use and some of the real-life jobs that geographers do. Finally, they write their own article about how geography affects their everyday lives. How Should I Study Geography? In this experience, students are introduced to the study of geography—what it is and what it isn’t. They explore and describe the six elements of geography. Next, they learn about the tools geographers use and some of the real-life jobs that geographers do. Finally, they write their own article about how geography affects their everyday lives. Describe key elements of geography. You’ve heard the term geography before and you probably know it has something to do with places and maps. But what IS it really? Is it a form of history? Is it a type of science? Is it compasses and charts and globes? 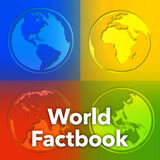 In this experience, you’ll begin to learn just how big a topic geography really is! Take a look at the first screen of this cartoon. Invite students to share some of their definitions. 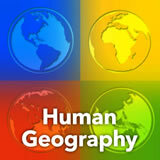 It is likely that students will name various aspects of geography. 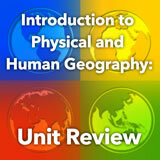 Point out that most of their definitions are part of what the study of geography is all about. Now read through the rest of the cartoon. What systems does geography explore? Which are examples of parts of human systems? There may be terminology that is challenging for students in this cartoon. Clarify terms as needed. For example, help them to understand that spatial is a word the means “related to space.” Guide students to focus on the big idea of the cartoon, which is that geography is a much broader area of study than facts about world locations. 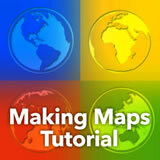 See the teacher pack for additional resources on introducing geography. The following Explore section presents the six elements of geography. Each element is presented in a separate scene. 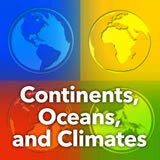 You can add hands-on examples for the elements: have students handle geography tools, such as a compass and maps; share postcards and travel brochures; compare today’s weather forecasts for different locations; distribute recipes from different regions; encourage students to share personal anecdotes; have bilingual students speak in a second language; and more.